Most kids want to be something like a firefighter when they grow up, but as a child Matthew Russell always choose a decidedly different path. Matthew Russell, a rising-senior in Liberty University’s engineering program, is still well on his way to making those childhood dreams come true. Russell’s parents homeschooled their children, allowing ample time for growth and exploration outside a traditional classroom setting. He soon became involved with local engineering fairs, as well as engineering open house days at the University of Kentucky. Through these experiences, Russell fell in love with the problem-solving aspect of engineering. 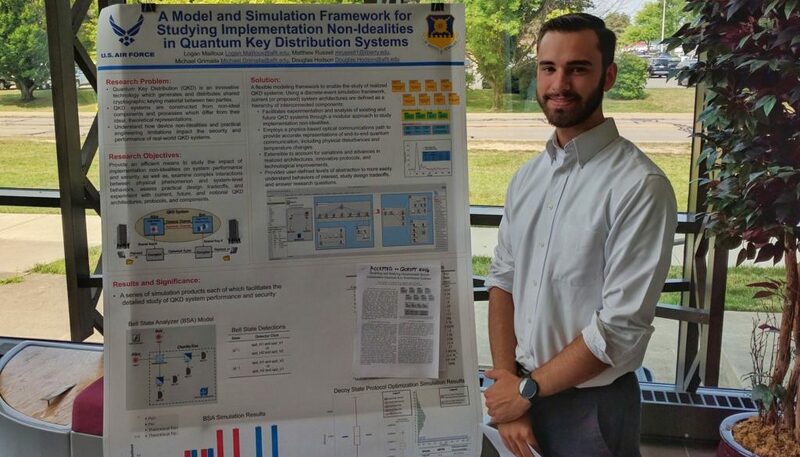 In the fall of 2014, Russell enrolled at Liberty University and has since had several opportunities to further explore the world of engineering. So far, he’s had research intern experiences at the University of North Dakota (UND) and the Air Force Institute of Technology (AFIT). This summer will bring internship at NASA’s Johnson Space Center, in addition. At UND, Russell worked with a project called OpenOrbiter. The program focuses on creating an affordable nanosatellite that can be replicated by organizations across the world. Russell’s work on the endeavor laid a conceptual base-layer for one of the spacecraft’s subsystems. He explored the possibility of programming the satellite to self-learn and refine its movements. This form of artificial intelligence would remove the need for software updates over time. 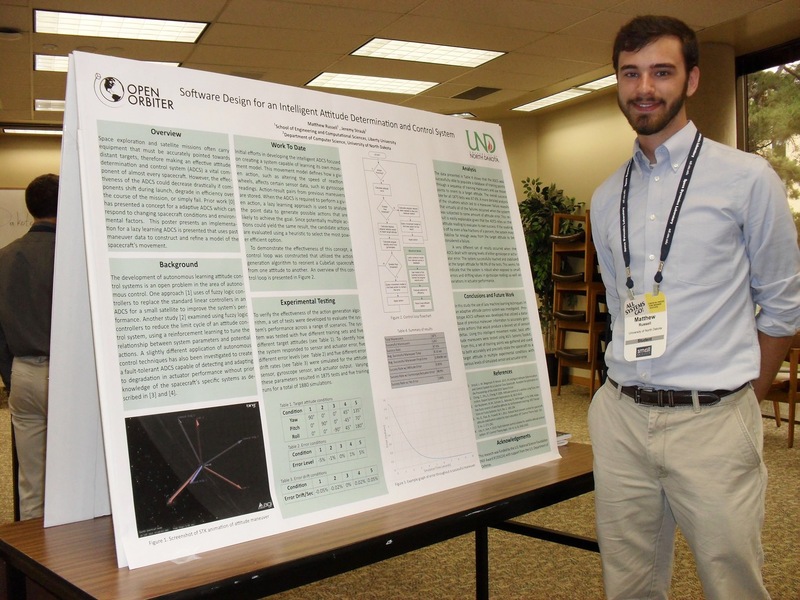 The following summer, Russell interned with the Center for Cyberspace Research (CCR) at AFIT. Through this opportunity, he gained access to state-of-the-art technology and the chance to explore CCR-related topics with which he was curious. Russell specifically invested himself in software projects regarding cyber security. 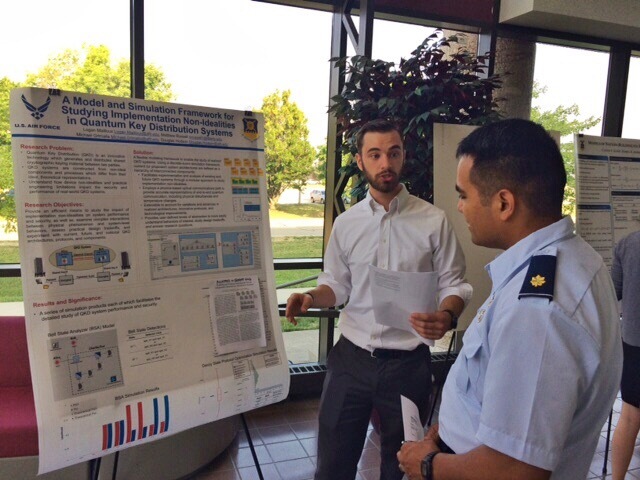 Russell presenting his CCR summer research. Now, Russell is on to an internship at NASA’s Johnson Space Center in Houston, Texas. According to Russell, it’s an amazing opportunity that gives him a glimpse into what he hopes his future might look like one day. Other plans for the future could include a PhD and eventual professorship at a university, having a career in robotics, or even starting his own company. However, Russell is confident it’s not by skill alone that he’s made it this far. His opportunities have often come through connections and chance meetings. In his mind, it’s not just all a coincidence, but there’s a larger entity at work in his life. “You can’t explain it other than God had his hand on (my life) in some way,” says Russell.